Topic : "Please help :( .. something is off bout this"
nice pic. it makes me feel good. i made a comment in another thread. 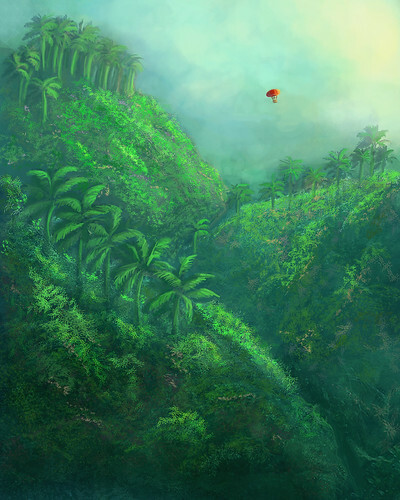 To make a piece with depth you gotta bend it more than what it is in reality, maybe the trees are pretty big in the reference you used but with 2d painting you do want to get some kind of illusion..... Well, that's what I would call it I guess. lol. I really think you are doing fine here though, the most important is to keep trying and to keep changing your subject which you are doing here, this will teach you the most I believe. To get back to your piece, it's also the scale of the balloon. 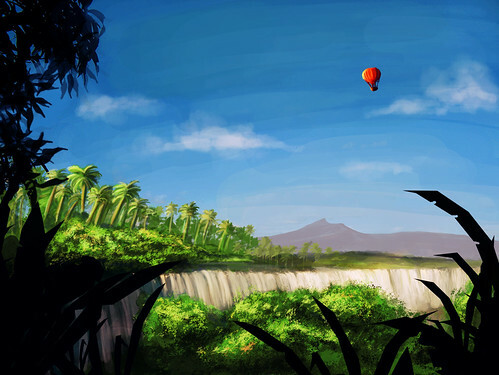 Either you wanna have the balloon as a background feature, or something that is in the foreground which in that case would make the balloon bigger and detailed. this is just a quick reply and maybe you've already noticed this yourself, but what I would like to see is a stronger aerial perspective that affects the saturation and hue of the landscape more.